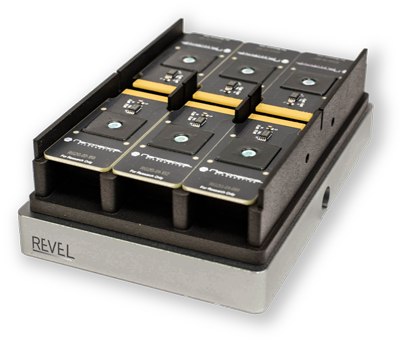 Nanomed introduces Revel, a breakthrough high-throughput biophysical platform for fragment-based primary screening. Using an orthogonal electrical sensing mechanism called Field Effect Biosensing (FEB), Revel measures up to 10 mM concentrations and drastically reduces nonspecific noise, so you can have confidence in your hits. 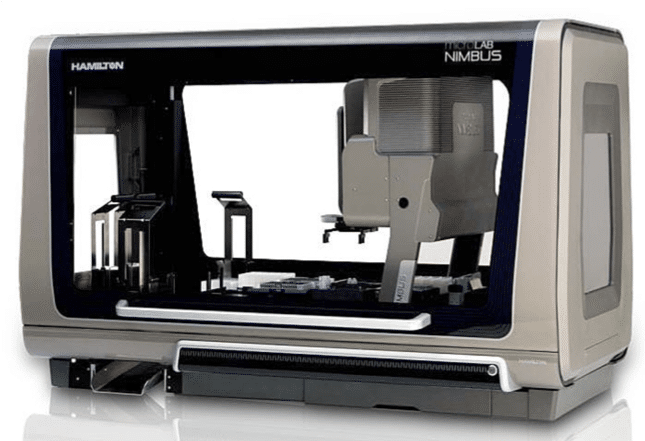 Revel is a 24-channel direct binding system that is fully automated with a 24-hour walkaway run time, designed to be used with a specialized Nimbus HD liquid handler by Hamilton Robotics. Revel enables 24 independent measurements to be taken simultaneously, and easy-to-use, built-in software acquires and analyzes data. 24 independent quantitative measurements for simultaneous analysis of up to 24 targets. 11-log dynamic range, from 10 mM to 100 fM. Analyte size starting at 10 Da. Sample volume: 40 µL; Target material: 0.5 ng. Sample compatibility: Solvents (10% DMSO), detergents. 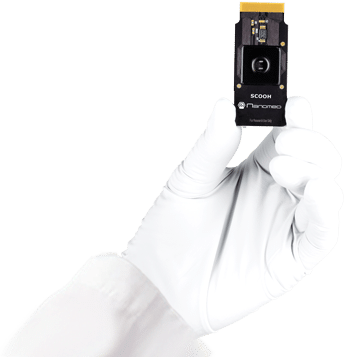 Speed of data collection: 2400 data points/minute/channel. 8 independent pipetting channels with independent movement in both Y and Z axes (Nimbus HD). Footprint: 41”L x 28”W x 48”H (Nimbus HD). Temperature range: 15°C – 35°C. Automated run of 576 measurements/day. High sensitivity for low affinity interactions. Easy, built-in analysis with automatic reference subtraction for reproducible quantitative results. Revel uses an electrical sensing mechanism called Field Effect Biosensing (FEB) that is unaffected by optical impediments like solvents and detergents, enabling dependable results in up to 10% DMSO. The graphene-based biosensor used with Revel is called SCOOH (“Super Amine-immobilization”), which provides a high-density amine-reactive, hydrophilic surface for target immobilization. Have a specialist contact me.